A young girl walks by balancing an enamel basin filled with mangoes on her head. A few minutes later, it’s a teenage boy with a huge rack of sunglasses. Next a mother, with infant daughter strapped to her back, walking beneath a towering basket of medicines. Then a middle-aged man with a foam mattress tied in a bundle. They are all trying to earn a living on the streets, and rather than wait for shoppers to come to them, they carry their wares through the city streets in hopes of finding buyers. 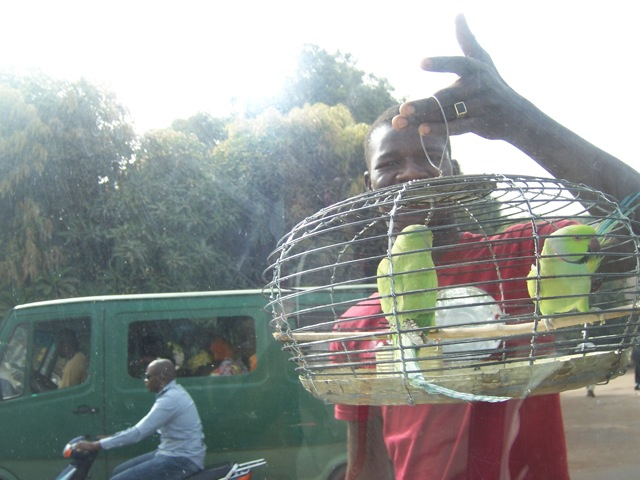 Ambulant vendors are an omnipresent feature of the landscape in urban Africa. They’re literally everywhere in Bamako, and have been since well before I first went there in 1997. 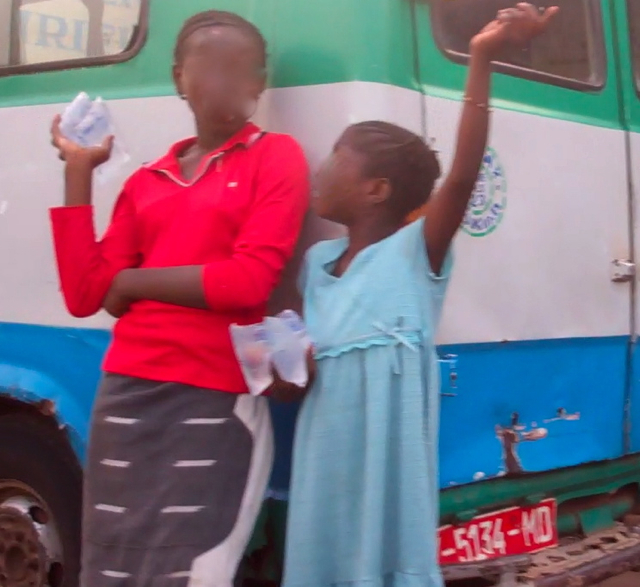 You could see them wherever buses had to stop, hawking snacks, fresh produce, drinking water. I vividly recall seeing a girl of perhaps six years with her bucket full of plastic bags of drinking water, trying to attract passengers’ notice and shouting “Dji bè, dji sumalen bè” in her small, piercing voice. Most of us who grew up in the “First World” probably aren’t used to ambulant vendors. In Mali I saw them as a curiosity at first, but I appreciated being able to stay in one place and have goods come to me. After a few months I virtually stopped noticing the vendors anymore. Drinking water is sold in plastic bags, for 10 to 50 francs depending on the size and quality. The vendors are usually young girls. I blurred these vendors’ faces, out of respect for their privacy and sutura (see my previous post). It wasn’t until my latest round of fieldwork in Bamako that I began thinking about them again. Perhaps it’s because there are so many in the city now; selling on the street has become the most common survival strategy. The luckiest vendors have places to sell from, maybe a market stall or a table under a shady tree. The rest wind up walking all day carrying their merchandise. The goods fall into every category imaginable: food, beverages, clothing, prepaid cell phone cards, chewing gum, health products, insecticides, portable electronics. Then there are the mobile services: shoe shines, shoe repair, tailoring, manicures. Some categories of vendors have signature sounds they make to announce themselves. Tailors tend to strike their scissors together, ting ting ting ting, to advertise their passage. (Many go by bicycle, with a hand-powered sewing machine strapped to the rear cargo rack.) In Brazzaville the manicurists would clink empty bottles of nail polish on their fingertips, making a singular sort of doing-doing-doing. I have yet to hear that sound in Bamako, come to think of it…. It occurred to me one day that I did not know these people; I had no friends who were ambulant vendors, and I knew nothing of their lives. Why do they do what they do? What are their days like? What challenges do they face? I decided to learn a little about them. As usual, I found it was best to go through people close to me, who already knew some vendors and could provide introductions. After making the acquaintance of a few street sellers, I hoped to get a first-hand glimpse into their work. I did this with the aid of a Flip HD camera, which is small, relatively cheap and requires no training to operate. I approached three vendors and asked if they’d be willing to have someone shadow them for a day with the video camera, resulting in a short web documentary. They could designate their own camera person, a friend or trusted associate, to follow them around. They would pick up the camera in the morning from a friend of mine in the marketplace and return with the footage at the end of the day. I compensated both the vendor and the camera person with a good day’s wages. Then, using the hour or two of footage the vendor had brought, I edited a short video clip. I did a follow-up interview with each, asking questions about their work and their lives. I used their responses to put together voice-over narrations for their clips. I showed a rough cut to the vendor before finishing it, to give them the opportunity to cut out any scenes they didn’t want to appear in the final product. (Nobody actually asked me to cut anything out.) When each clip was finished, I burned a copy to DVD and gave it to the vendor. The first person I recruited for this project was Mamadou, an 18-year-old guy who sold imported packets of cookies downtown. He arranged to video his friend, another cookie vendor, but the footage wasn’t great. I asked him to gather a second day of footage, this time with him as the subject, and it came together nicely. The camera work can be pretty jumpy, and the sound isn’t wonderful, but you get a window into a world you otherwise might never see. Mamadou then served as the cameraman filming the second subject, a woman named Fanta who sold pharmaceutical products (various cold remedies, pills, tablets and patent medicines) on a daily route from Sogoniko to Dar Salam to Dibida and back, a circuit of at least 10 miles. Mamadou got great footage of her workday, and I was quite pleased with the final product. I gave Fanta her copy of the video (in Bamako, even poor families like hers usually have a cheap videodisc player), but a few days later when I saw her in the marketplace she told me she’d hidden the disc for fear that her husband wouldn’t approve of her having participated in the video project. I realized that although she’d agreed to take part, and despite my best efforts to explain what the project was about, Fanta hadn’t given what researchers call “informed consent” — never having gone to school, she didn’t know what the internet was and had no idea what the consequences of her participation might be. Therefore I couldn’t post her video or any other images of her to the web. I’m obligated to protect my subjects against any potential risk from associating with me and my work; as I wrote in my previous post, I also try to be sensitive to their expectations of sutura, not to lose face in public, not to be humiliated. My third subject was Brehima, an affable fellow who sells yugu-yugu or used clothing. He had his friend Sekou, a fellow used clothing vendor, follow him with the Flip camera through the streets of Badalabougou. There were many more such videos I wanted to make. I wanted to do one of the wotorotigiw, the young men who push handcarts of goods around all day. I wanted to do one of the boys who walk around with shoeshine kits, charging 50 francs (10 cents) a shine. I wanted to do one of the guys who sell phone cards at busy intersections. Unfortunately time didn’t permit, and my fieldwork came to an end before I could undertake any of these. But I do think the Flip documentary project model is a worthwhile one with enormous potential for research and teaching, and I hope to try it again at the next opportunity. I’d be interested to know of similar efforts by other researchers, to get an idea of what’s worked and what hasn’t. Of course I cannot generalize from my tiny sample of vendors. Based on what I’ve seen, however, I doubt many people go into this line of work except as a last resort. It is tiring and minimally profitable. Many are on the margins of the law: Fanta, the medicine vendor, faced the daily threat of having her merchandise confiscated by the police. All the vendors I spoke to said they would happily do something else if they could find another job. Yet some of them also derived clear satisfaction from selling (this was the case for both Mamadou and Brehima whose videos appear above). Given their druthers, I’m sure they would be vendors — but in a nice shop where they could sit down every once in a while, and not have to carry their goods around all day under the elements. Even such modest ambitions might be unrealistic nowadays: just as Bamako’s streets are super-saturated with ambulant vendors, its formal commercial sector is bursting at the seams. In both cases it’s a problem of too many sellers, not enough buyers. I wonder whether Bamako has outlived the days when small-scale retail trade was a common route to economic self-sufficiency, even success. For Mamadou’s and Brehima’s sakes, I hope it hasn’t. This entry was posted in Uncategorized and tagged bamako, vendors, video. Bookmark the permalink. This was excellent, Bruce. Love the approach and the videos turned out great. Welcome back to blogging, Bruce! Hard to express how much I enjoyed this post. It was like a short trip back to Mali. Wonderful to see the dignity with which you approached the subjects, and the obvious affection that you have for them. It is heartening to see the ethic and pride that they bring to their work. How many Americans would last even a single day at such a job? I always wondered what their lives were like when I saw them walking around. I figured there couldn’t be too much profit in street selling because there were just so many people selling the same stuff. Both fantastic videos and fascinating project Bruce. The second video especially, was really well filmed holding the camera stable. I always remember the signature sounds and the rhythmic (almost rapping) voices of mobile vendors. In Tanzania, water carriers will normally kiss their lips very loud to announce their presence. Other vendors have a stack of coins in their hands and clank them together. 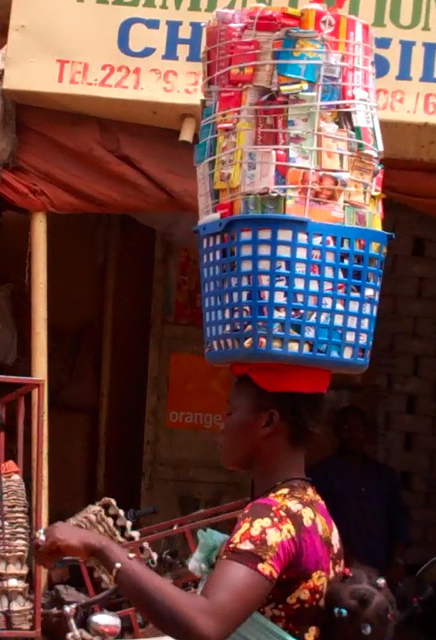 Great insights into vending culture in Mali! Bruce, these are a very interesting stories produced and presented in a very respectful way. Your introduction to the videos is a very good read. Hope to see you back in Mali once! I hope to see you there too — but I’m waiting for the “classe politique malienne” and the “communauté internationale” to come to some sort of agreement to resolve the current impasse, and at this rate I might have to keep waiting for a long time! Quite so! Blurred faces, a haze over the city and an obscure near future. Fantastic! !I am from Mali and I really enjoyed your documentary. It even gives me the idea to do that kind of documentary as my field work experience somewhere. What not in Mali? You mention that you “doubt anyone goes into this line of work except as a last resort.”. For many young and old in and around Bamako, it is a dream to be able to sell. Investing the start-up money to purchase the items is difficult. I watched many young women scrub and wash for years to earn the money to buy a basket-full of medicine. Great post, Bruce! I’ve lived in Bamako for several years now and one of the most fascinating things for me is finding out how much (or how little) people earn in a day/month. Did you know that Malian security guards at the US Embassy (employed by the global security firm G4S) make 50,000F per month? That’s about 100 bucks! It’s hard to support oneself, let alone a family, with that kind of salary. I know! It’s insane. Most maids for Malian families make 5,000-10,000/month. From the people I’ve talked to, servers in restaurants make about 30,000-50,000/month. I am constantly amazed at how people can get by with those kinds of salaries. Furthermore, how can we expect security guards to defend an embassy when their salaries are so minimal? Great post, something I have thought about a lot as well in my time in Mali. I am sure you have read Preschool in Three Cultures by Tobin which used video in there methodology. This could be streamlined into an ethnographic method and make a good book, I think. Great blog! Being exiled to Burkina for the moment it takes me back. What a joy to see Brehima! I used to buy yugu yugu from him. My husband is still wearing a great pair of pants I bought from him while he was walking around with his merchandise! I love street vendors, especially when they just walk up to you and have exactly what you need on a particular day, be it water or a shirt! Still, it’s a hard life in the heat. Fortunately Brehima also has a stall in the market where I expect he can get out of the sun a bit in the very hot midday.